It might be assumed that coronary heart disease (CHD) has always been with us, that it is with us today, and that it will be with us always. But during the past century CHD has changed both in quantity and in quality. It appears that CHD was very rare during the first two decades of the 20th century, and it was a rare cause of death. Things changed in the mid-1920s. This was described very clearly by Dr Maurice Campbell, a leading UK cardiologist during the 1960s. During the early part of the 20th century there was a gradual reduction of number of deaths from disease of the heart valves, which were due to syphilitic and rheumatic heart diseases. Details can be seen in a previous Post: “The onset of the epidemic of Coronary Heart Disease”. While deaths from diseases of the heart valves were reducing, the total number of deaths from heart disease showed an increase. Something new was happening, either a new disease was emerging or there was an unexplained major increase of a form of heart disease that was previously uncommon and unimportant. This is clear in Figure 1. We can see the blue graph-line that indicates all heart deaths. 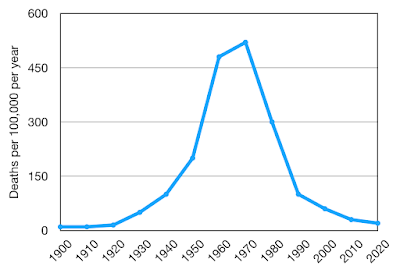 There is an increase after about 1923 and the increase is persistent. 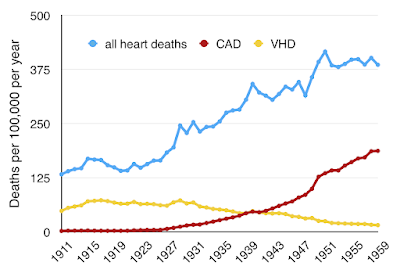 At the same time deaths from valvular heart disease (yellow graph-line, VHD) is declining. 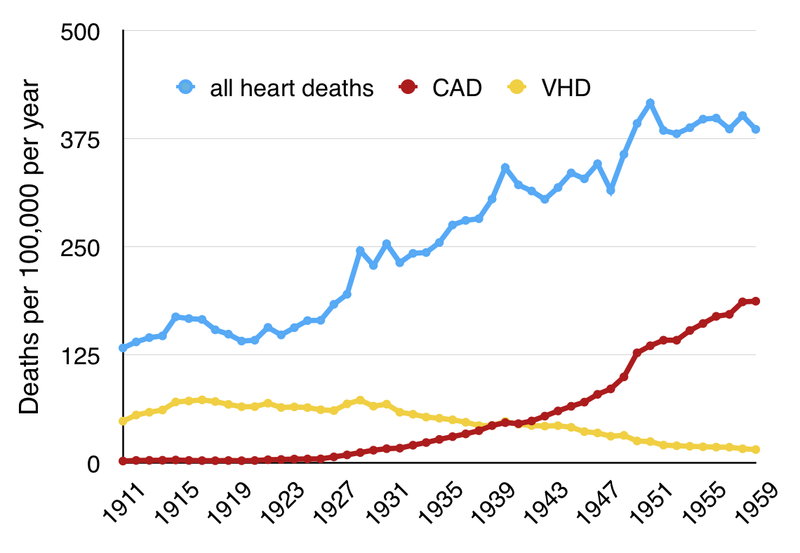 The red graph-line shows the emergence of coronary heart disease, here labelled as CAD, coronary artery disease, an alternative term). The increase of heart disease deaths continued exponentially to a peak in about 1970, and thereafter fell rapidly. It became clear that the “new” heart disease was coronary heart disease, CHD. This recognition was based on autopsy studies, and it is this, the pathology, that defines the disease. We can argue about a diagnosis based on clinical features: are there changes in nomenclature, or is there more case-finding? For example the lay term "heart attack” is used very loosely and cannot be the basis of a specific disease. Myocardial infarction (MI) is the specific medical term, based on clinical features together with autopsy findings, and in this we find certainty. The pathology identified the disease particularly in the walls of the coronary arteries of the heart. There was an inflammatory basis to the disease that was occurring in what are called “plaques”. Autopsy following typical death from myocardial infarction identified the plaques rupturing through the lining of the coronary arteries into the lumen. This process is called plaque rupture, very much like an erupting boil. 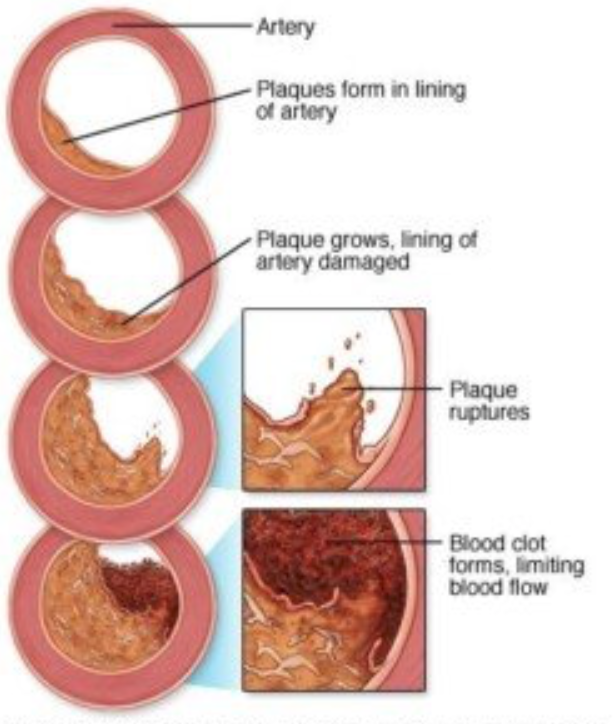 It could initiate a blood clot, causing complete occlusion of the coronary artery, with sudden death or the clinical features of myocardial infarction. This was something new. 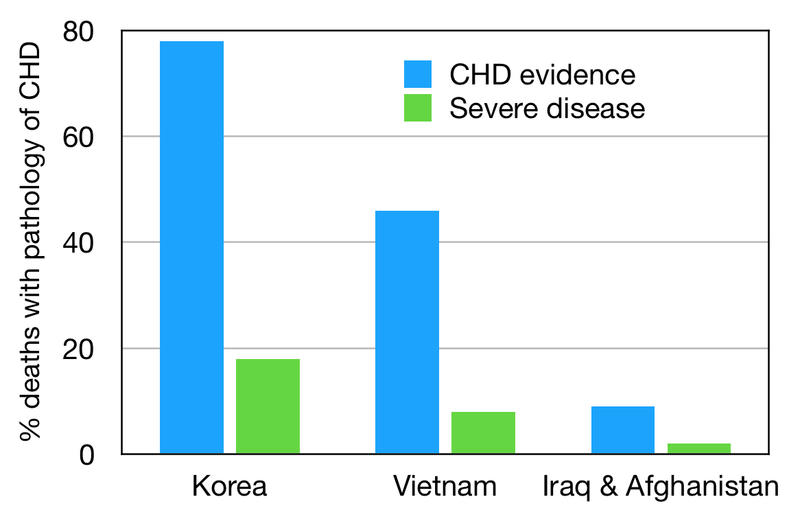 Although CHD deaths were most common in late middle age, they could also cause death young adults. It became clear that the pathological process developed at an early age, identified in autopsies perfumed on young adults who had died as the result of injury. 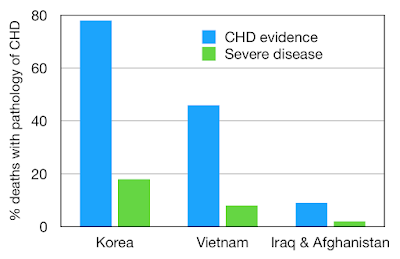 The epidemic nature of the new CHD in the UK is obvious in retrospect but most people seem to be unaware of it. A mild form of CHD continues mainly in the elderly but the death rate has declined considerably. Is the decline a result of preventative medical interventions, and in particular the widespread use of statins? The answer is clearly “No”. Despite what we are told, statins have only a minor effect, reducing ten year mortality by just 1%. And statins were only widely used after the year 2000. 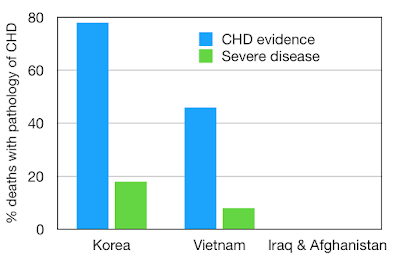 Important pathological investigations have demonstrated that the epidemic of CHD has been in a dramatic and spontaneous decline, and this is not due to medical interventions. 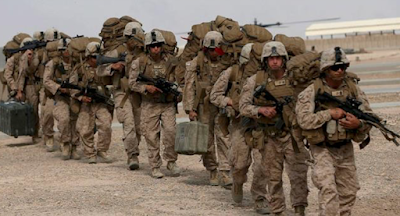 This information has been based on the autopsies performed on young US soldiers killed in military action. It has been possible to compare three generations in three episodes of warfare: The Korean war (1951–1953), the Vietnam war (1968–1978), and the Iraq and Afghanistan wars (2000–2011). Medical services were very advanced during these wars, based on experience gained during the two world wars earlier in the 20th century. Autopsies were performed regularly and this allowed detection of diseases and abnormalities incidental to the injuries causing death. In the second half of the 20th century, coronary heart disease was recognised as an increasing public health problem and major cause of death. The experience in the Korean war led to the confirmation that onset of the disease was in early adult life, or even in late childhood. 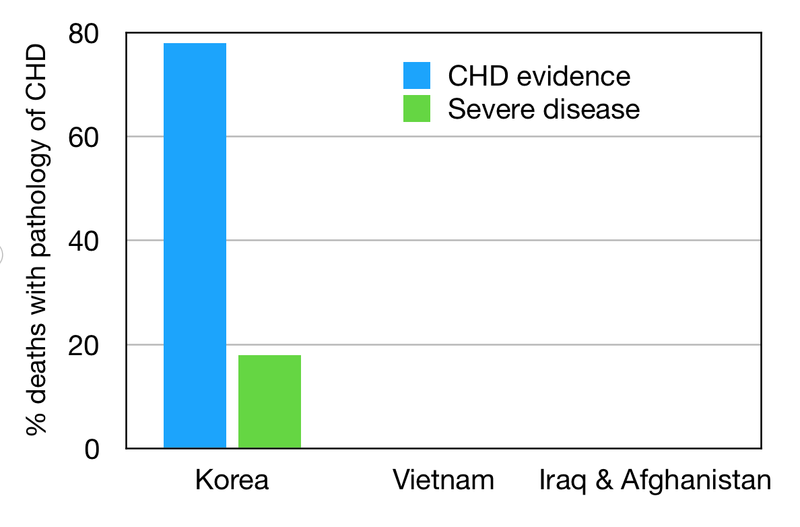 Autopsies performed during the Korean war identified the presence of coronary heart disease in almost 80% of the soldiers killed in action, and severe disease in almost 20%. This shows the very serious nature of the epidemic of CHD as it was developing in the 1950s. The soldiers would be in the age range 18–28 years, and this was the recognition that the origins of CHD were early in life. They would probably have acquired the disease in the 1930s. Had they not been killed in action, they would no doubt have died from CHD about 30 years later, in about between 1970 and 1980. The next major US war was in Vietnam, between 1968 and 1978. 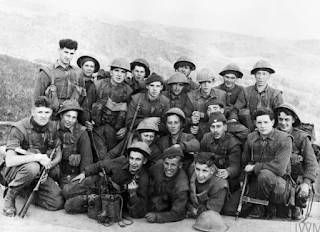 The soldiers would be of the next generation, born in the 1950s with parents born in the 1920s. 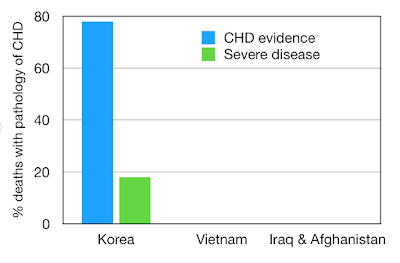 Once again deaths in conflict allowed the assessment of incidental CHD, and it was about half of what was found in the Korean war. There was evidence of CHD in 46% of autopsies, and of severe disease in 8%. This was a remarkable reduction in the prevalence of CHD, but it seemed to provoke no curiosity at the time. The reduction cannot be explained on the basis of medical intervention or change in diet. Then came the wars in Iraq and Afghanistan, after an interval of thirty years, another generation. The prevalence of incidental CHD had on this occasion fallen much more dramatically There was evidence of CHD in fewer than 10% of autopsies, and severe disease in only 2%. The very high prevalence of CHD in autopsies of young men in the 1950s was frightening, and it was of course a predictor of the peak of the epidemic of CHD deaths that came to be 20 years later. The dramatic decline of evidence of CHD in young men cannot be explained in conventional dietary terms. 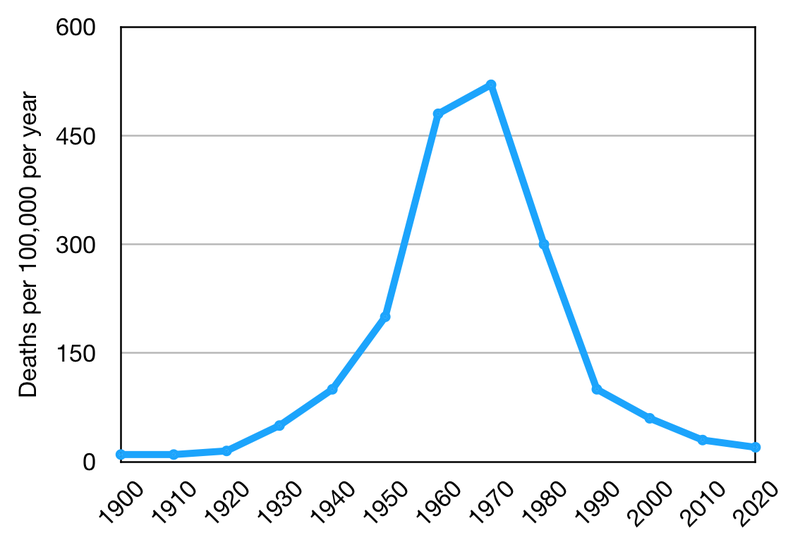 It was clearly a spontaneous decline of a serious disease causing many deaths of pandemic proportions. This study of autopsies performed on soldiers killed in action is the most objective and uncontroversial evidence of the decline of CHD. Such autospsy evidence did not emerge from the two earlier world wars. At that time in the first half of the 20th century CHD was not a significant public health problem, and routine autopsy services in conflict would not have been possible. I have explained in previous Posts that the only plausible explanation for the cause of the pandemic of CHD was a novel micro-organism. Its rapid decline would be the development immunity acquired initially by the first generation. Antibodies would have developed even though the disease might have been fatal. This acquired immunity would be transmitted to the next generations though natural inheritance, amplified by subsequent generations if the disease were still active. This is exactly what we see in these wartime studies that the disease declined rapidly within three successive generations.